For more information, see Bladder Cancer, as well as Pathologic Findings in Squamous Cell Bladder Carcinoma and Cystoscopy. Small cell carcinoma of the urinary bladder usually has a polypoid or nodular appearance and often has an ulcerated surface. Pathology gross examination reveals a solid tumor mass that originates from the mucosa and often penetrates deeply into the bladder wall. In 68% of small cell carcinoma of the urinary bladder cases, they are mixed with classic urothelial carcinomas or adenocarcinomas of the bladder. 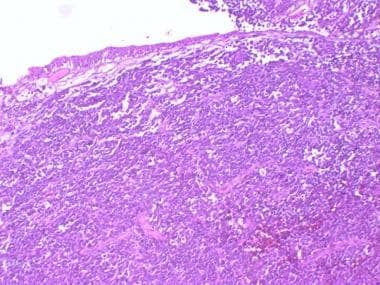 The histologic features of small cell carcinoma are the same as those in other organs. The tumor is made of sheets and nests of loosely cohesive, small, round or oval cells with very scant cytoplasm (see the image below). Small cell carcinoma of the bladder. The tumor is made of sheets and nests of loosely cohesive, small, round or oval cells with very scant cytoplasm. The tumor cell nuclei are hyperchromatic with coarsely granular chromatin. Nuclei molding can be seen. Mitosis is present and may be frequent. Nucleoli are absent or small. Tumor necrosis is often present. Urinary cytology often reveals single and loosely cohesive clusters of tumor cells with typical small cell carcinoma morphology. Small cell carcinoma of the bladder. 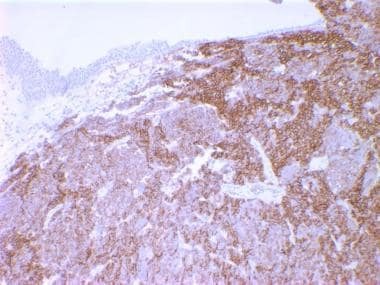 Neuroendocrine markers, such as chromogranin A, synaptophysin, CD56, and neuronal specific enolase, are often focal or diffusely positive for this tumor by immunohistochemical method and are useful to help establish a diagnosis. Trias I, Algaba F, Condom E, Español I, Seguí J, Orsola I, et al. Small cell carcinoma of the urinary bladder. Presentation of 23 cases and review of 134 published cases. Eur Urol. 2001 Jan. 39(1):85-90. [Medline]. Cheng L, Pan CX, Yang XJ, Lopez-Beltran A, MacLennan GT, Lin H, et al. Small cell carcinoma of the urinary bladder: a clinicopathologic analysis of 64 patients. Cancer. 2004 Sep 1. 101(5):957-62. [Medline]. Christopher ME, Seftel AD, Sorenson K, Resnick MI. Small cell carcinoma of the genitourinary tract: an immunohistochemical, electron microscopic and clinicopathological study. J Urol. 1991 Aug. 146(2):382-8. [Medline]. Podesta AH, True LD. Small cell carcinoma of the bladder. Report of five cases with immunohistochemistry and review of the literature with evaluation of prognosis according to stage. Cancer. 1989 Aug 1. 64(3):710-4. [Medline]. Terracciano L, Richter J, Tornillo L, Beffa L, Diener PA, Maurer R, et al. Chromosomal imbalances in small cell carcinomas of the urinary bladder. J Pathol. 1999 Oct. 189(2):230-5. [Medline].